Key lime trees are cold-sensitive, so they should only be planted in the warmer tropical and subtropical areas of the country. They will grow best outdoors in zones nine and higher. In colder areas, it is best to grow the key lime in a container that can be brought inside when signs of frost are present. Planting a key lime tree is not that difficult and follows the same basic steps as planting other varieties of citrus. Select an area to plant your key lime that will receive full sunshine. It is also best to plant the tree on the southern side of the house to protect it from the cold, northern winds. Allow at least 12 feet of room on all sides of the key lime to properly grow. Remove any grass or weeds from the area where you intend to plant the key lime. It is best to maintain a weed-free area at all times around the base of the key lime tree. This will allow the tree to absorb moisture and fertilizer properly. Plant your key lime tree directly in the soil without amending it. Key limes prefer a soil medium that drains well, thus sandy soils are perfect for growing a key lime. They will even grow well in soils that are rocky. Clay soils will retain too much water, and the lime tree may develop root rot and die. Dig a hole directly in the soil that is a little wider than the key lime’s container and at the same depth of the container. Place the tree in the hole, allowing the tree to be planted slightly higher that what it was growing inside of the container. Do not plant the key lime deeper than it was growing inside of the container. This will add undue stress to the tree, and it may die. Cover the opened areas around the root ball with soil and water thoroughly. Stamp down on the ground to make sure any air pockets remaining in the soil are removed. Water the newly planted key lime tree three to four times a week for the first three weeks. Cut back to watering once a week for the next several months. Once the tree is established, you can cut back the watering to once every 10 to 14 days. Fertilize the key lime tree only after new growth has appeared on it. 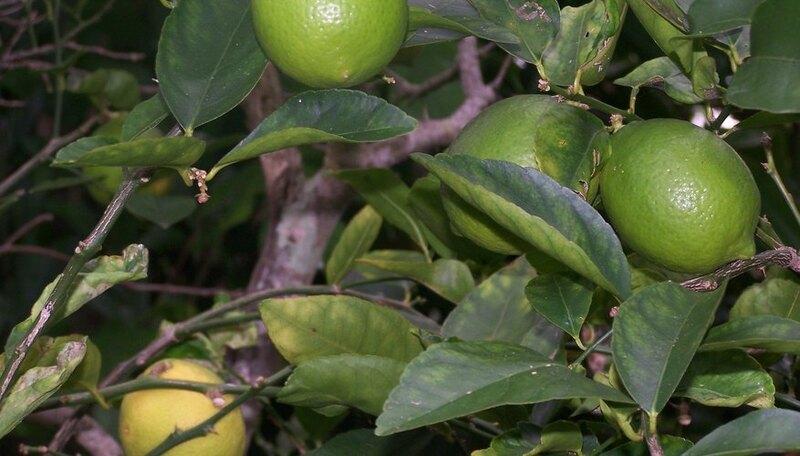 Use a high-quality, all-purpose citrus fertilizer. Continue fertilizing the tree four times a year. Lime trees are afflicted with very few pests that are life-threatening to the tree. If you must spray an insecticide, figure out what type of insect you are dealing with and select a spray specifically designed to use on key lime trees. Do not mulch around key limes or other citrus trees. The additional mulch can cause the soil to retain too much water and cause the tree to develop root rot and die. Never allow the key lime tree to grow in constantly flooded conditions. It will develop root rot and die.